Joe Folk - Mowbray & Son, Inc.
Joe Folk graduated from Center, ND high school. He worked various jobs until he attended Bismarck State College and completed the HVAC program. 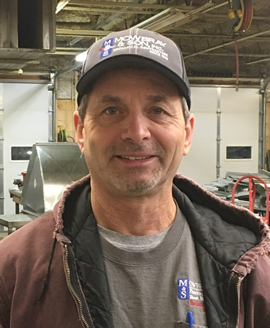 In 1980, Joe joined the sheet metal workers union as an Apprentice. In 1984, he became a registered Journeyman. Joe worked for various mechanical contractors in North Dakota (M & S Sheet Metal, Inc and McFarlene), Minnesota, and California. Joe changed directions for a while and went back to college to receive his B.S. in Marketing and a B.A in Psychology. Joe was re-hired full-time in 2006 to work for M & S Sheet Metal, Inc and City Air Mechanical, Inc. In 2012, Joe became an Apprenticeship Trainer for the Sheet Metal Local #10. He has worked on several projects including the MAFB B52 Munitions Facility, the MAFB Commissary, Minot International Airport, and the Mountrail County Justice Center.